Epson ink cartridges are engineered to work specifically with your Stylus printer, Artisan, WorkForce and Expression printers to produce vibrant, rich color and glossy black text at professional quality levels. 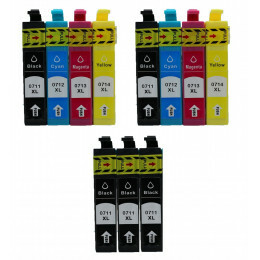 These ink cartridges are known for their exceptional integrity, long shelf-life, and impressive page yield, and as a result it is no surprise Epson is the third largest seller of printers on the planet. According to the 2014 Market Share by Unit Sales Statistics, Epson ranked third on the international list with 13.2 percent of the global market share, and today it still sits comfortably in the same place with a 19 percent market control. 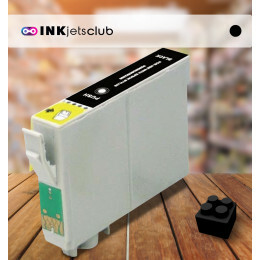 This means inkjetsclub.co.uk had to place stringent quality control efforts in our remanufacturing process of Epson ink cartridges in order to offer our customers cheap prices on a superior quality inkjet that performs on par with the OEM version. 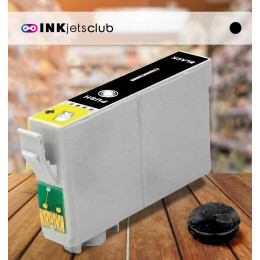 If you want to know where to buy cheap Epson ink cartridges of the highest integrity, let inkjetsclub.co.uk pair you with superior quality remanufactured inkjets that are a cut above the rest! Our customers who buy our remanufactured Epson ink cartridges save up to 85 percent off and range from your typical households, to small businesses, to large corporations, and even students, artists and government agencies faithfully order our ink and return to take advantage of our cheap Epson ink prices. 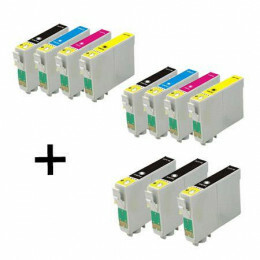 Want to know what the best deal is on printer ink to meet your needs? Call our friendly customer service department and let us help pair you with a cost-saving combo pack of superior quality inkjets you will love! Does Epson Make Laser Toner? Epson doesn’t make laser toner for the American market. It seems that one of their marketing strategies is to get people to abandon their laser printers for their new line of monochrome WorkForce printers. Epson says their printers are 60 percent cheaper than laser printers and offer the same monochrome printing for less. All of our replacement Epson ink cartridges are engineered to work with your printer at OEM standards, so if the manufacturer promises savings, just imagine what we can do to offer the best deal on ink for Epson printers! Is Epson a Good Printer Brand? Epson is a very good printer brand. According to a survey conducted by ‘PC World Magazine’, most printer brands demonstrated “up and down” results across a number of qualities. Epson was one of the few that ranked well in a larger selection of fields with particular emphasis stressed on their reliability and feature satisfaction. The survey also showed that many users prefer Epson print quality to other inkjet printers. For inkjetsclub.co.uk this meant we had to be extra diligent in our remanufacturing process to make sure customers get the professional finish in their colorful prints offered by the OEM. Thanks to our certified quality control officers monitoring our printing tests, we have achieved this goal, and our 1 million repeat customers can testify to the exemplary quality found in our cheap Epson ink cartridges that truly make our stock the best deal on printer ink, anywhere!